As the temperatures increase and we enter summer, swimming pools are an ideal way to stay cool. 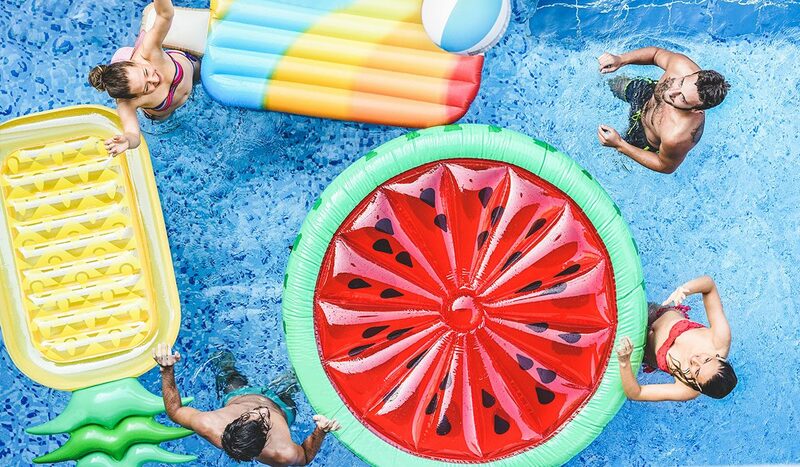 Not only do pools help bring close friends and families together during the heat, but it also adds additional value to your home. Building a pool can enhance your home’s landscape design and create the aesthetic you have always dreamed of. Whether your goal is to add value or just for looks, having a pool will still be a great addition. At Pools by Design, we understand how it can be challenging to choose between all the different kinds of pools that are on offer. Therefore, we will help you through the process of finding the perfect swimming pool for you. Patio pools are a great way to enhance the landscape of your home. They are designed with the surrounding area in mind. Patio pools can be built in many different shapes and use a wide variety of materials. The types of pools to consider are fiberglass pools, concrete pools, and vinyl liner pools. Many patio pools or inground pools are usually shaped like rectangles with cuts or rounded corners. Before you begin the process of building your inground pool, it is crucial to adhere to the city codes and regulations. Designing an in-ground pool requires you to consider the depth of the pool and its overall usage. For instance, is the pool for swimming laps or just for splashing around? Swimming pools can serve a wide variety of purposes, and it is critical to find one that fits your lifestyle. Patio pools and ground swimming pools can help change the aesthetics of your home. At Pools by Design, we will guide you through steps of finding your dream backyard oasis. When we imagine what we want our dream swimming pool to look like, we look up all the different designs and customizations we can do. Unlike regular patio pools where there is usually a set design, custom pools are entirely up to you. The ball is in your court. From shape to material and overall aesthetics, you have the power to pick and choose from infinite possibilities. Unlike having a standard patio pool, you can design your pool with as much uniqueness as you would like. Everyone has different preferences when it comes to aesthetic appeal, so we give you the option to design it exactly how you want. With such a large variety of options available, it is paramount that you hire a company you trust to walk you through the process and ensure that your dream pool turns out precisely as you want it. Pools by Design can help you with the customization process, so you end up with the perfect pool that enhances the look of your home. An infinity pool is a type of swimming pool that is designed to create an effect where there is seemingly no ending to the pool, giving the appearance of a continuous surface of the water. This is done by having the water flow over multiple edges to make it seem like an endless view of the ocean. Though building an infinity pool is pricey, it will create a breathtaking look that can accent any landscape design. The cost of having an infinity edge pool built will end up increasing the value of your home even more than a traditional pool. Infinity edge pools may not be common and are usually seen in city skyline settings, but we can help you make your vision possible almost anywhere you can imagine. At Pools by Design, we understand that the process of finding the perfect pool for your home can be a challenge and we want to help ease that stress for you. We are knowledgeable in all of the different types of pools and what to consider when building one for your home. From environmental factors to landscape architecture, Pools by Design will help you figure out which type of pool matches the style of your home. It is crucial to have enough outdoor space to build your dream pool and spa. We will educate you on both the process of having a pool built and the maintenance requirements of owning a pool. Swimming pools hold more value than just their aesthetics. They have to be a functional place where you want to utilize often. Being able to design the pool of your dreams can change how much time you genuinely want to spend at home. Owning a home is one of the most expensive things you can do in life. You want to create a living space you genuinely want to spend time in. Building a pool is not an easy job, but at Pools by Design, we will make it as seamless an experience as possible. Contact us at (520) 797-6675 or send us an email at info@poolsbydesignaz.com to schedule a consultation with one of our professionals. We look forward to helping you build the swimming pool of your dreams.